This unit of work was created in partnership with The Garret and accompanies their interview with John Marsden. Please click here to access the Interview, Bibliography, Show notes and Transcript and Author profile. The following activities and tasks have been designed to be studied and used in full or in part, depending on the teaching context. The activities have been formulated for use with a whole class or small groups, and a suggested grouping is individually noted in each activity. All activities can be adapted to suit smaller groups or individual students. 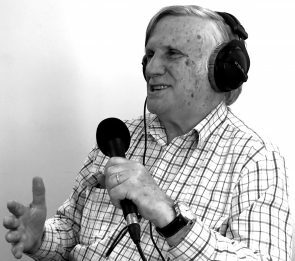 Each activity is linked to a specific section of John Marsden’s interview and the relevant portion of the interview is noted at the beginning of the activity. This relates to 4:39 mins–5:01 mins of the interview. This activity is born out of the texts that Marsden read as a young adult. Marsden cites The Catcher in the Rye as one of the most powerful texts he read as a young adult, that ‘absolutely connected’ with him and provided inspiration for his writing, not knowing that he was ‘allowed to write like [that]’. Divide the class into small groups and distribute the opening chapter of The Catcher in the Rye. Students to read individually and then come together to discuss. Any other devices or techniques at the teacher’s discretion. What is your first impression of the narrator? Why do you think this might have captured John Marsden’s imagination? In what ways do you think this excerpt is powerful and contemporary? Direct students to undertake a writing task experimenting with or imitating the techniques they’ve uncovered in The Catcher in the Rye. From 5:52 mins–7:05 mins of the interview. This activity derives from Marsden’s description of his reading catalogue while growing up as ‘dead white authors mostly’. Growing up in a very Anglo culture, Marsden asserts that he ‘never encountered any writer from Africa or South America or Asia’. Discuss the assumptions that your students may have brought to the reading of this text. How does this text challenge your assumptions? How does it help you to understand cultural differences? Research and compile a chart or Venn diagram that illustrates the differences between traditional Western storytelling and the chosen method. With their partner, students are to ‘translate’/rewrite/create a story that follows the guidelines for their culturally different storytelling method. As most of these have a performative element, students should be given the opportunity to plan, rehearse, edit and perform to the class. This relates to 21:09 mins–22:15 mins of the interview. Marsden says that he writes from ‘experience and observation a little more than imagination’. His emphasis on his preference for writing realistic fiction forms the basis of this activity. Prepare students ahead of this lesson by asking them to brainstorm interesting stories that they have heard or that have happened to them. Instruct students to tell their interesting story to their partner/s. The partner/s may take notes about the key points of the stories they hear. Students return to their notebooks and flesh out the details of one of the stories they have heard. Students to write a short story that describes an aspect of their own culture. From 7:06 mins–8:10 mins of the interview. Marsden’s texts often include the physical act of writing, through letters, diaries or an urge to document experiences. In this part of his interview, he discusses the ‘posterity that writing offers’. In pairs, students should read two of the excerpts from Marsden’s novels Tomorrow When the War Began, So Much to Tell You or Letters from the Inside that demonstrate how Marsden has used the physical act of writing in his novels. What can be garnered about the characters from a diary or letter that cannot be learned through plot development? What issues might there be with relying on letters or diaries to tell the story? What are the benefits of including letters or diaries in a story? Create a set of circumstances surrounding the reasons one of your characters needs to resort to the physical act of writing in your story. Using the format of a diary, reveal something about your character’s personality that may have otherwise been difficult to ascertain. With a partner, create two characters who write to each other and develop a story line between them. This relates to 12:10 mins–14:55 mins of the interview. Marsden talks at length about the importance of the writer keeping a collection of fragments of language in their minds to provide potential inspiration for their work. This activity stems from Marsden’s statement that the English language doesn’t allow for particularly expressive or descriptive language. Paint colour charts from a local paint shop/hardware store. A variety of magazines, newspapers, brochures, catalogues and other print material. In small groups, students should see how many words they can come up with that describe emotions/feelings. Alternatively, teachers could also use the collected paint colour charts to conduct the same activity by seeing if students can continue to brainstorm descriptive names for colours. Direct students to look through the magazines provided to collect examples of ‘beautiful fragments of language’. Students should cut out or write down the examples for use in a task. Students could also collect fragments of quotations, advertising catchphrases, song lyrics or poetry. From 14:56 mins–17:01 mins of the interview. Marsden references George Orwell’s advice about editing in this section of the podcast. He also discusses the importance of knowing the rules and conventions of English to break them for effect. Introduce students to the concept of pleonasms (the use of superfluous words or unnecessary repetitions). Instruct students that they will be writing a press release about a grave matter at their school. Their task is to write as superfluously as possible when documenting the details of this matter. When finished, students swap with a partner. Each partner should try and ascertain what the matter at the school is. They should then rewrite the press release in simplistic and straightforward language. Students to use the fragments of language that they have collected and compose a slam poem using ten of their favourite examples. This activity relates to 23:36 mins–26:17 mins of the interview. Marsden discusses his process in writing his first novel where he spent so much time editing that he ‘never finished anything’. Using Marsden’s advice about writing without stopping, students can see if this is a strategy they could use themselves with their writing. Students to video themselves telling a story without stopping – even if they make mistakes, proceed past them. Students should watch the video back and write down suggestions for how to improve their story. These could be suggestions for their expression, plot, character traits, descriptive language, etc. Students to record again and then swap their video with a partner. Each student to watch their partner’s video and assume the role of editor, making suggestions to parts that could be cut from the story to improve, employing Marsden’s ruthless advice to just ‘cut it out’. This feedback to go back to the original creator for consideration. This task is inspired by Marsden’s command of the English language, and of his assertion that writers can use language to serve their motives, agendas and aims. Students will experiment with ‘doing away’ with the rules and conventions that they have been taught about the English language. Click to download the Rich Assessment Task (PDF, 98KB).